The following is a homily that was delivered at St. Francis of Assisi Church and St. Romuald Chapel in Wakefield, Rhode Island USA by Deacon Paul O. Iacono on the weekend of the 5th Sunday of Lent – March 16/17, 2013. Last week’s Gospel related the story of the prodigal son; this week the prodigal daughter stands before us. These two people start with dissent against authority and its commands. Their actions led to life altering, almost near death experiences. They end their self-destructive journey with a conversion that speaks to all repentant sinners of the availability of the astonishing love, mercy, and forgiveness of God. In last week’s Gospel, the merciful father pardons his prodigal son; today, God’s merciful Son pardons the sinful daughter. Last week, the oldest son questioned the father’s reasoning; today, the Jewish elders question Jesus’ reasoning, and He responds to this challenge with questions of His own. This inquisitive command forces even the most proud and dogmatic of them into uncomfortable moments of self-reflection, and to see in that mirror their own sins – which results in their silently walking away. 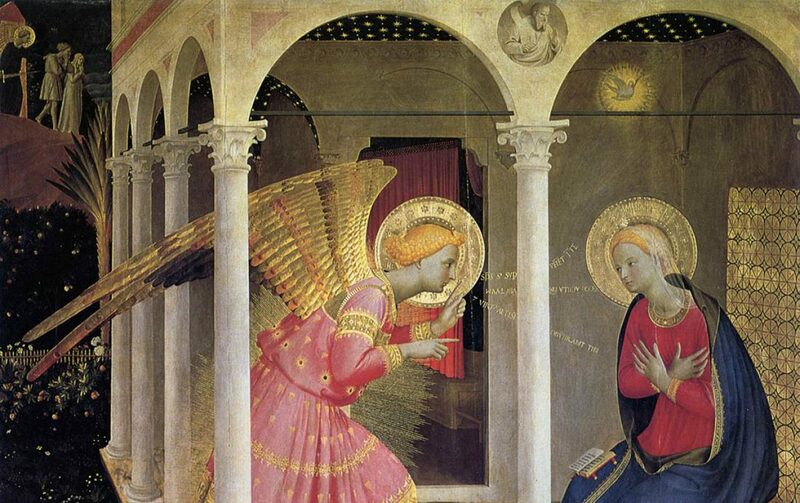 Then Jesus turns, and looks at the woman – twenty-four hours earlier she was beautiful and appealing. What does He see now? A woman whose feet were bloodied from running in panic through the streets, clothes torn, hair askew, mind and heart filled with panic at her impending death. Her defiance of the 6th Commandment was gone; as she was running for her life defiance gave way to abject terror and remorse, and when finally caught, her grief gave way to despair. In lust’s name, she had betrayed married love – publicly humiliated and publicly condemned – she stood surrounded by the mob – waiting for the first rock to be thrown – staring alternately at Jesus and the ground. Stunned with disbelief she must have stood there for a few moments, staring into Jesus’ eyes, the realization of His forgiveness washing over her – her heart filled with a new sense of hope and an overwhelming awareness of the invitation to live in His love and mercy. The woman caught in adultery was blinded by her own lust, caught in the web of darkness she was unable to hear and speak to God, yet, what does Jesus do? He opens her eyes and ears; He gives her interior light; He covers her nakedness with a mantle of love and mercy and renews her ability to live a life that respects the laws of God. In the stories of the prodigal son and daughter, we have a new awareness that in our own ways, we too, are prodigals; and relief – relief in the knowledge that when we do Sacramentally repent, and attempt to sin no more, we receive extraordinary graces and the invitation to live in the love of divine mercy. This is the meaning of Lent my brothers and sisters. For it teaches us that we have no reason to fear Christ – no reason to fear reconciliation with Him – for He freely offers us His Sacramental strength so that we may walk in His freedom, be renewed, and become more like Him. Like the prodigal son and daughter, let us put aside our sinful ways, and grasp the hand of our merciful God in Sacramental Confession. Let us trust in Him; for Jesus’ love is vast and the waters of His mercy, to those who repent, continually refresh and satisfy our deepest longings to rest in Him. Copyright © 2011- 2013 Deacon Paul O. Iacono All Rights Reserved. Notes on painting: The above artwork is a preliminary sketch by Rembrandt for his finished painting on Christ and the Woman Taken in Adultery (1644). I thank art historian Gary Schwartz for providing an image of that sketch at his website: www.garyschwartzarthistorian.nl/. Rembrandt’s finished painting is now displayed at the National Gallery in London, England. Thank you for the re-blog on your site. Yes, this Gospel provides a wonderful meditation for the time leading up to Holy Week. I like that: the prodigal son and the prodigal daughter, each forgiven and treated with the utmost compassion. One thing that always bothered me about this parable: that Jesus didn’t direct any challenge to the social/cultural idea that she was the only one involved in the act of adultery. To this day, in many parts of the middle eastern Muslim world, it only the woman who is punished. As if she could be adulterous alone. I know I should focus on the point, but I can’t help but wonder about this. Maybe it is just the author of the gospel who didn’t want to “go there” with his challenges as he wrote down the stories of Jesus. Good point, but I have always found that the Gospels tell us that Jesus’ emphasis was on the redemption of humanity while simultaneously teaching, healing, and preaching. Yes, I agree, it was a teaching moment about the inequality of women within the established Jewish legal system, yet, from the perspective of Jesus the more important issue was the one of the sinfulness of all of the men who were accusing her – and part of that sin was the way they perceived women as being the source of the evil while the man was “duped” into the seduction. That attitude was ancient within the Jewish culture prior to Jesus – really ingrained into Jewish tradition and the Mosaic law (and it is still evident within certain parts of the world today). This contributed to the Christian faith becoming so appealing to the 1st and 2nd century Jews and Gentiles – especially from the poorer levels of society – Christianity offered equality before the eyes of God. Yet,the even more important point on the part of John’s gospel is that he wanted to give evidence to the truth that Jesus’ love and divine mercy were open to all women and men – and that mercy is freely given to all who sincerely repent and make the attempt to “sin no more.” In the case of the woman caught in adultery – she was specifically told to “go, and sin no more,” in other words it was a specific command given to her to change her lifestyle and stay true to her own marriage vows or don’t violate another’s vows. It is a dynamic and very rich teaching story.